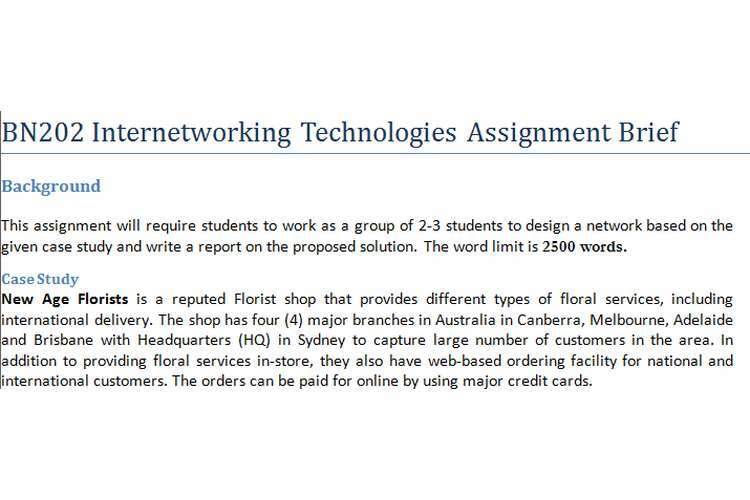 This BN202 internetworking technologies assignment brief will require students to work as a group of 2-3 students to design a network based on the given case study and write a report on the proposed solution. The word limit is 2500 words. New Age Florists is a reputed Florist shop that provides different types of floral services, including international delivery. The shop has four (4) major branches in Australia in Canberra, Melbourne, Adelaide and Brisbane with Headquarters (HQ) in Sydney to capture large number of customers in the area. In addition to providing floral services in-store, they also have web-based ordering facility for national and international customers. The orders can be paid for online by using major credit cards. New Age florists get a significant portion of their orders through their on-line ordering facilities. Web-based orders (online) get stored in their central file server(s), which is located in Sydney, but should be accessible from any branch using appropriate networking technologies. The reliability of their file and web servers is of high importance. New Age Florists also wants to make sure that the network downtime is not more than 0.04%. Furthermore, the servers need to be protected from malicious computer attacks and unauthorized access. Facility to carry out audit checks needs to be provided as well to so as to keep track of the exact activity along with the date and time at which an employee of New Age Florist carried out a computer system based activity. The activity could include doing task(s) such as installation of new software, changes in Webpage etc. The web server is also located in the Sydney Headquarters (HQ) in the same location as the file server(s), to host a homepage for the business. This server also acts as a chat server for providing real-time chats by the customer service personnel with customers who wish to get some quick queries answered before they order online. Each branch also has 10 networked printers and a fax machine, as well as E-mail communication facility for staff use. Each of the branches of New Age Florist also provides WLAN based service for customers to access the Internet while visiting the store. A key issue is that the visitors should not have access to the resources of the staff on the company’s internal network. New Age florists in each of their branches have 200 employees who have been provided with laptops whilst the HQ in Sydney has 300 employees. Each branch has 4 departments while the HQ has 5 departments with networked PCs to form an internal network. Staff in all the branches and in HQ has access to the WLAN as well. Some of the employees may telecommute from their homes over the weekends. Each of the employees whether they are in shop or telecommuting need to be connected with a secure connection over a wired or a Wireless LAN connection, whichever may be available. Business goals: This section should include the business goals, priorities and constraints. Technical goals: This section should include the technical goals in your own words. Characterize the existing internetwork and network traffic: This section should briefly describe the existing internetwork and traffic. Network design proposal: This section should have detailed diagram clearly showing the campus network layout, the cabling layout, the devices and their location. Your design should also include IP addressing issues, design for a secure wireless access, proposed security strategies and routing protocols selected for the proposal. The diagrams should be accompanied by a description of how it all comes together and works. Network applications: This section should mention all the applications that will be used for the proposed solutions and the purpose of these applications (if applicable include brief comparison with other applications with similar functionalities). Your report should document the system requirements for these applications and if the existing system meet the requirements or not. If not, then what is proposed solution? You should also prepare a table showing the name and type of the applications, their criticality and other necessary comments. Network Devices: The proposals should clearly mention all the devices chosen for the proposal and explain the reason for choosing/selecting the network devices. You should also clearly state where you would place the devices. Cabling: The proposals should clearly explain the type of cabling you plan to use. Make sure that you consider; media types, distances, numbers of switches, locations, network architectures involved, transmission speeds, cabling changes, and so forth. Costing: This should contain a summary of the costs of hardware and software that this design would require the client to purchase. Executive summary with a statement of what has been completed. Acknowledgement of the names of all people (including other students and people outside of the university) who have assisted you. List of references used (IEEE style) – please specify if none have been used.